A talk show at an international conference? It works! Guests Richard Friend (Institute of Social and Environmental Transition in Bangkok), Cassidy Johnson (University College London), Anna Sjödin (City of Karlstad, Sweden) and Aditya V. Bahadur (Overseas Development Institute, London) were interviewed by Cynthia Rosenzweig (Urban Climate Change Research Network), contributing from their different perspectives, from critical and more praxis-oriented social sciences to urban flood risk management. 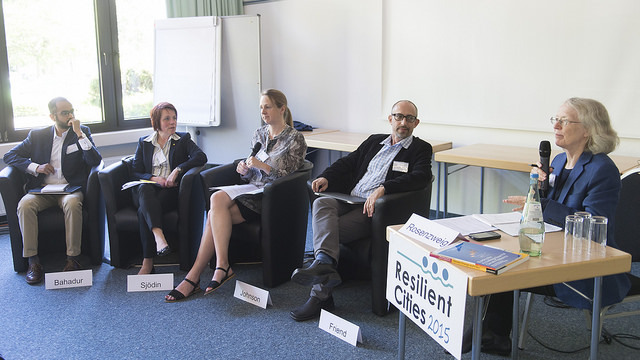 Cynthia Rosenzweig hosts the talk show at Resilient Cities 2015. City practitioners have limited time to scan all research results; a meeting platform for practitioners and researchers could help. Cities have a lot of data and not enough time to make use of it; ways of sharing the data should be found. Urban resilience projects are driven by capital flows; these capital flows and investments need to be governed but also critically observed. Modeling climate and disaster risks and vulnerabilities can make good tools, but how can cities use them if they do not have computers? There seems to be little information on the actual shocks and impacts on people. Action research involving different stakeholders can be a powerful tool. Many cities face similar challenges. However, they also have specific problems, and each city needs to find its own response. Framing all agendas around resilience and climate change might be the wrong approach; instead, communication and research approaches should be followed in a social process. Guidelines can help different stakeholders to work on the same issues. Researchers need to talk to people and find out what they actually need, opening up a space to discuss the evidence. There is not always a need for further knowledge but rather for assessment of why the change is not happening. Institutions and processes should be created that allow for a more inclusive future. The session resembled a panel discussion in some ways, but the set-up as a talk show made the debate more open, interesting and joyful. The talk show format can enrich this type of conference as it allows for a lot of interaction.